The present State of Alaska within the United States of America was the site of the first Orthodox Christian liturgy held in the western hemisphere. The liturgy was conducted aboard the ship St. Peter, that was anchored in Alaskan coastal waters, on July 20, 1741, the Feast day of St. Elias. For the next one hundred years Alaska was the center of Orthodox evangelization among the indigenous population in Alaska, until the arrival in North America of the Orthodox immigration from the predominantly Orthodox lands of eastern Europe in the late nineteenth century. During the sixteenth century Russian frontiersmen, called promyshlenniki, advanced eastward from European Russia in search of valuable fur bearing animals for the fur trade. The advance of these fur hunters was followed quickly by fur traders, merchants, and missionaries of the Orthodox Church. Sixty years after the Cossack Ermak crossed the Ural Mountains in 1579, the Cossack Dimitri Kopylov reached the Pacific Ocean, in 1639, at the sea now known as the Sea of Okhotsk. The promyshlenniki had traveled within a life time eastward about 5,800 miles, across the length of the Asian continent. Over the following years, the Russians consolidated their possession of this Asian territory, now known as Siberia, and established trade relations with China, to the south. As the presence of Russians increased so did the Church. As the Russian frontier advanced eastward a fork southward occurred when the Albazin fortress on the Amur River was taken by the Chinese. This defeat in 1685 brought Orthodox Cossacks as prisoners to a settlement in Beijing that led to establishment of a China Mission. The Treaty of Nerchinsk, signed in 1589, formalized Russian trade and boundaries with China and provided an impetus to advance further to the east, on to the peninsula of Kamchatka. In 1719, Tsar Peter I ordered an expedition to Kamchatka to settle the question of whether Asia and north America were joined or not. This expedition was unsuccessful. Peter was so obsessed to have a precise answer to this question before he died that he ordered a second, larger expedition. This one was to be led by the Dane Vitus Bering. Before the expedition could start Tsar Peter died. After Peter’s death in 1725, the order for the expedition was continued by his widow, Catherine I.
Sts Peter and Paul Russian Orthodox Church, on St. Paul Island, Alaska, founded 1830. Following the route pioneered by Kopylov in 1639, the Vitus Bering led expedition that took a year and a half to reach Okhotsk, arriving in the fall of 1727. Bering moved on to Kamchatka the following spring. Here his expedition built a boat, named Saint Gabriel, that sailed north along the Siberian coast looking for evidence of the American continent. After searching for two months he convinced himself that the two continents were not joined, but he had not sighted the American coast. Returning to St Petersburg, Bering was criticized for not physically confirming the separation of the continents. A new expedition was formed that finally sailed in June 1741 from the base on the Kamchatka peninsula, named Petropavlovsk, in two small square rigged ships, the Saint Peter and Saint Paul, commanded by Bering and Captain-Lieutenant Alexis Chirikov respectively. Separated by the foggy gloom of the northern seas, the St Peter, with Bering on board, arrived on July 16, 1741 at the Alaskan coast with a view of the snow covered mountains that were to be named the Saint Elias Mountain Range. On the same day Chirikov on board the Saint Paul discovered Sitka Bay. On July 20, 1741, which was the feast day of St Elias, hieromonk Illarion Trusov, assisted by priest Ignaty Kozirevsky, celebrated a liturgy in thanks for their success. This was the first Orthodox Liturgy held in the western hemisphere. On the return to Petropavlovsk, the St Peter wrecked on an island where Vitus Bering died and which now bears his name. Over the next fifty years promyshlenniki continued to visit the Aleutian Islands and southern Alaska. Many brought their Orthodox Christian faith with them that influenced the indigenous natives with whom they worked. In 1784, the merchant Gregory Shelikhov established a permanent colony at Three Saints Harbor (now known as Old Harbor) on Kodiak Island. On September 24, 1794, a group of monks from Valaam Monastery (numbered between eight and ten) arrived to evangelize the native population thus beginning the spread of Orthodox Christianity in the New World. Among these were St. Herman of Alaska, and St. Juvenaly of Alaska. (The others named are Archimandrite Joseph (Bolotov), the Hieromonk Macarius, Hieromonk Athanasius, Hieromonk Stephen and Hieromonk Nectarius as well as Hierodeacon Stephen, and Hierodeacon Nectarius.) They landed at Kodiak, and while this would serve as a central point of their missionary activities, it was from this point that they traveled all around southern Alaska, travelling thousands of miles, going as far as the Aleutians. It was in Kodiak that the first Russian Orthodox Church was constructed in Alaska, in 1795, Holy Resurrection Church. By this time, Russians had been in Alaska for many years, and some evangelization had been made among the native Alaskans by laypeople who were members of the Russian American Company. Some of these, such as Osip Prianishnikov, worked very hard to spread the Gospel among the Alaska natives, even learning the Kodiak, Aleut, and Chugach Yupik languages. However, the attitude toward the Church and the Native Alaskans was not shared by all. For many years, the Russians and the Alaskans battled for primacy over the territory. Eventually, the Russians were able to exert more control, and the Russian American Company eventually became the dominant player in the fur trade in Alaska, which at that point was the major economic reason that Russia had interest in the territory. Shelikhov himself, despite calling for the missionaries to Alaska, was known for his cruelty toward Alaskans. For many, the Christianization of the native people had more to do with trying to pacify, control, and Russianize them rather than actually bringing them the Faith. Furthermore, baptisms were sometimes performed for the purpose of appointing Russians as godparents, thereby giving them much more influence on the families of the Alaskans, whose culture, in general, directed them to be very reverent towards ancestors, including godparents. By 1800, although there were very few official Orthodox churches established, there were numerous communities that had come into contact with the Orthodox church, and thousands had been baptized. Besides the church in Kodiak, a church had been constructed in Karluk prior to 1800, and one in Old Harbor was constructed soon afterwards. Sitka would follow in 1808. (The first church located on St. Paul Island is believed by many to have been built by Russian sailors in 1779, though ascertaining this precisely is difficult.) Assessing the situation in 1796, the Holy Synod decided to create an auxiliary see in Kodiak and named Archamandrite Joasaph to lead it as bishop. Tsarina Catherine II of Russia refused to grant Shelikov's Russian American Company exclusive right to business in Alaska, but after her death in 1796, her son Paul I granted that right in 1799. The Russian American Company, for most essential purposes, became the government of Alaska, and they were in charge of managing the territory, including the spiritual needs of Russians, Creoles (those of mixed Russian and Alaskan ancestry) and the Alaska natives. Many expected that the clergy sent to the Alaskan territory would merely be puppets of the Russian government or the Russian American Company, but, by and large, they worked largely independently, and at times would report back on the "bad behavior" of the Russian Administration. As far as the missions went, the missionaries did not believe in "Russianizing" the native Alaskans as much as bringing them the Gospel. Fr. John Evseyevich Popov-Veniaminov (glorified now as St. Innocent of Alaska) was a shining example of this, volunteering to go to the Aleutian Islands in Alaska as a young priest, and tirelessly laboring there for most of the rest of his life. He built a church there (Holy Ascension Church) to replace a chapel that had been constructed in 1808, and he visited many islands, always recording information about the people and their ways of life. Almost immediately, he began working on translations of Church materials into Aleut languages so that the people could understand Christianity in their own languages. Later, he would be transferred to Southeast Alaska, where he did the same thing, but this time among the Tlingit peoples. C. J. Tarasar, Gen. Ed. Orthodox America 1794-1976 Development of the Orthodox Church in America. The Orthodox Church in America, Syosett, New York, 1975. Hector Chevigny. Russian America - The Great Alaskan Venture 1741-1867. The Viking Press, New York, 1965. Robert R. Rathburn. 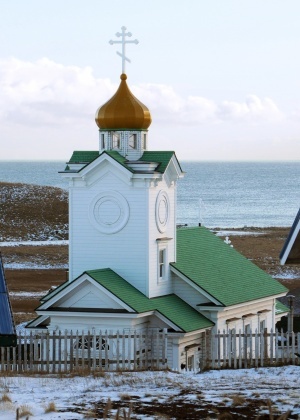 The Russian Orthodox Church as a Native Institution among the Koniag Eskimo of Kodiak Island, Alaska. Arctic Anthropology. Vol. 18, No. 1 (1981), pp. 12-22. This page was last edited on July 12, 2016, at 19:37.